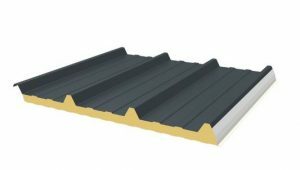 The JI Roof 1000 LPCB certified Trapezoidal Insulated Roof Panel is used for pitched roofs or horizontal and vertical wall application and an external insulated cladding panel for industrial, commercial, Agricultural and public buildings. Due to its metal inner and outer sheet, it combines thermal resistance with big spans. The minimum pitch to be applied is 4° or more after deflection. 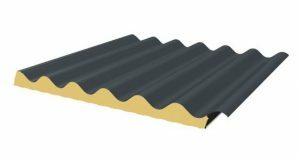 The JI Ecopanel Trapezoidal Insulated Roof Panel is used in pitched roof applications and as an external insulated cladding panel for industrial and Agricultural buildings. Due to its light aluminium inner sheet it is suitable for use in aggressive environments as it will not rust or rot. The outer sheet is available in a wide range of colours and bears the same aesthetic finish as the JI1000R The JI Ecopanel carries similar properties to the JI1000R when it comes to thermal resistance also offering large spans. The minimum pitch to be applied is 4° or more after deflection. 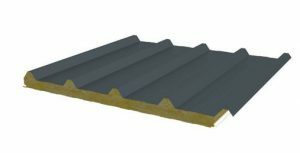 Vulcasteel Roof is a mineral wool roof panel with trapezoidal metal outer sheet and metal liner. As the panel has a mineral wool core it offers fantastic fire resistance properties. The panels can be used in Commercial, agricultural and industrial projects from pitches of 5° and onwards. The JI Onduroof Insulated Roof Panel is used for pitched roofs or horizontal and vertical wall application and an external insulated cladding panel for industrial, commercial, Agricultural and public buildings. Due to its metal inner and outer sheet, it combines thermal resistance with big spans. Similar to the JI Roof Panel with a corrugated outer profile. The minimum pitch to be applied is 4° or more after deflection.